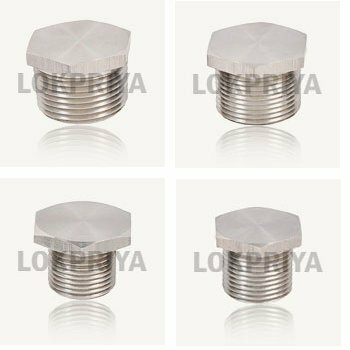 We are a trustworthy enterprise offering superior grade Stop Plug in the market. The product is developed by our experts using quality raw material such as S.S. 304, 316, 316L, Brass, or any other metal as per the specific requirement of our client. For the ease of our clients, we cater the products in Metric and NPT types of threads that range from M20 up to M50 and ½ NPT up to 1 ¾ NPT. Further, the requirements of our clients related to its length and other threads can be adjusted. This product is offered with Natural finish suitable for laser marking and plating or coating can be done as per the customer’s requirement. Lokpriya Metal Corporation was founded in the year 1977. For more than 30 years the company has been serving the metal industry. With the view of diversification and touching the new spehers in the industry we have started manufacturing of precision turned stainless steel components & metal components in the year 2007. To do so the company has adopted to establish a most advanced work shop for its manufacturing facilities situated in Jamnagar. With our state of the art CNC machinery we are capable of manufacturing custom stainless steel components & metal components based on specific customer requirements at competitive pricing and minimal lead times. Today this time company specializes in components from various types of stainless steel grades 316, 316L, 304, 303. We have mastered the art of crafting stainless steel within increasingly close tolerances. We are dedicated to applying our advanced manufacturing technologies to the rapid development and manufacture of stainless steel & other metal turned components for different applications and technologies. The technical knowledge and a more close personal involvement of top management in the work shop floor makes us different from other players in the industry. We provide a wide range of stainless steel tube compression fittings, hydraulic hose couplings, pipe fittings, pressure guage components, process control equipments parts, pressure switch components manifold instrumentation components and other fittings designed and manufactured to the highest standards made from stainless steel grades 316, 316L, 304, and 303. Our components are used in industries such as petrochemicals, chemicals, desalinization, chromatography, and hydraulics etc. where high precision fittings are required to work at high pressure, our components are suitable to perform.